"Satpreet Kahlon creates beautiful installations in striking, sumptuous materials that call into question the unseen boundaries and tacit assumptions that permeate art-world dynamics, often incorporating a critique of how the exhibition venues that show her work are complicit in these systems. For the group show BorderLands, her installation contained a tongue-in-cheek takedown of the premise of running an exhibition about national borders in tandem with a commercial art fair. Her 4Culture show features, among many other things, two similarly shot videos of the artist and her mother mopping their kitchen floors. That one is considered "art" while the other is typically regarded as a mere gesture of domestic labor speaks volumes about the kind of production we value, and as a result, the individuals we tend to ascribe cultural value to." This show is a question I cannot stop asking. About my hands (which look like my mother’s hands, but are not seen like my mother’s hands), their labor (which, like the labor of all hands, is never good enough and never over), their perceived value (as extremities attached to an artist’s body that allow an artist to do what an artist should do, which is to create spectacle or object), and how the value that is granted to them (by institutions run by systems outside of my control and understanding) is conditional, limited, and fleeting. The value that has been granted to me, my hands, and their produced labor (as evidenced by the appearance of my words here for you to read, my work in the gallery for you to see, and the $8,500 grant entrusted to me by 4Culture for the manifestation of this show) is conditional, and this conditionality is dependent on many things, including: my continued obedience to institutional norms and professionalized behaviors, my ability to sustain a pace of production that attempts to fulfill exponentially growing demands for consumption, and (in a time where we are seeing an increased valuation of critically engaged political art) the unspoken agreement that my critique of the institution must be both institutionally sanctioned and marketable by the institution to increase their social capital and standing. This is not to say that I am not grateful for the things that I have received from 4Culture. Nor do I believe that any of the above mentioned conditions are unable to coexist with genuine good intentions, good outcomes, and good experiences. But the knowledge of one's institutional acceptance cannot and should not ever be divorced from the precarious nature of this acceptance, as well as the fact that, although institutions may be benevolent when they deem a cause worthy of their benevolence, they can never truly be just, humane, or generous. The institution's conditional benevolence forces us to limit our imagination to the things that the institution can see, understand, and imagine. It erases and systematically eradicates, through a lack of support and recognition, entire populations’ ways of making and modes of thinking, while simultaneously proliferating a worldview that relies increasingly on the institution’s patterns of support and recognition to determine what is valuable. This show then, while abiding by in order to benefit from all of the above mentioned conditions and structures, is an examination of how value is determined, who is left out of and erased from these determinations, and how even the value that isn't being erased must be continuously replicated and performed to satisfy our desire for consumption. If answers to any of these problems exist, they won't be found in this show. In their place, there is a desire to reflect on our individual complicity in the structures that oppress and exploit us, and a hope that, even if we must exist within these systems, we can find a way to do so while honoring, revering, and remembering those who the institution chooses to forget. 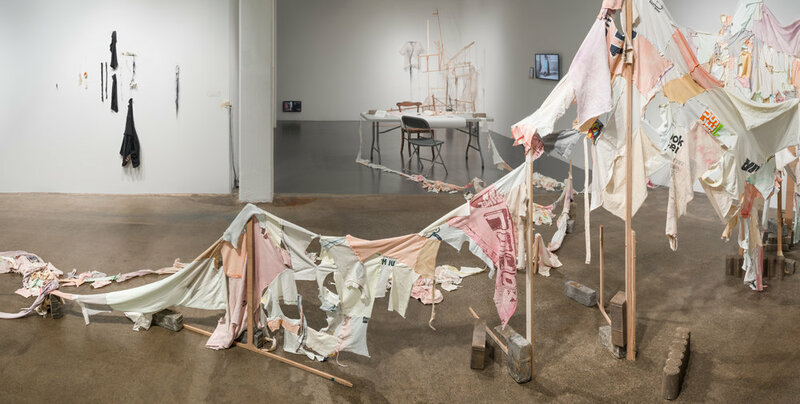 Description: A “quilt” of reconstructed t-shirts creates a spooling and unfurling loop around the gallery, hanging on series of stands created with found wood. Description: The artist sits in one chair at the table with a long looping strip of piled around the gallery and coming across the table. By hand, the artist takes out the pins and stitches the t-shirts together. Across from the artist is a chair with signage that invites viewers to come sit and undo the stitches that the artist created, replacing them once again with the pins. This performance occurs at the opening, at the closing, with guest artists performing intermittently during the duration of the show. Description: Videos on small tablet-sized screens of the artist facetiming with her grandmother, her mother, and then staring at herself in the camera screen after both conversations are over. Screen 3: 5 minute video, looped, of the artist’s hands while she undoes the thread that her mother had sewn onto the grey t-shirt. Description: Several ghost-like t-shirts made of translucent fiber tied to and being weighed down by a haphazard scaffolding on the verge of collapse. On the ends of the mass of dark blue threads that hang off the shirts are hundreds of sewing needles. Description: A video of the artist’s mother mopping her kitchen floor at the end of a long day, which is something she has been doing consistently for at least the artist’s lifetime, around the corner from a video of the artist mopping her own kitchen floor, which is something she did specifically for this show and most likely won’t ever do again. This exhibition has been supported by a 4Culture Art Projects Grant. Thank you to my mother, Kulwinder Kahlon, and my grandmother, Manjit Kaur, for agreeing to collaborate with me on the show (and for being such inspiring and wonderful matriarchs). Thank you to Molly Mac for her help in installing the new media elements of the show, as well as to Sharon Arnold and Janet Galore for generously lending monitors to the show. Thank you to my sister, Simran Kahlon, for her help in recording videos of my mother with me art directing over facetime.